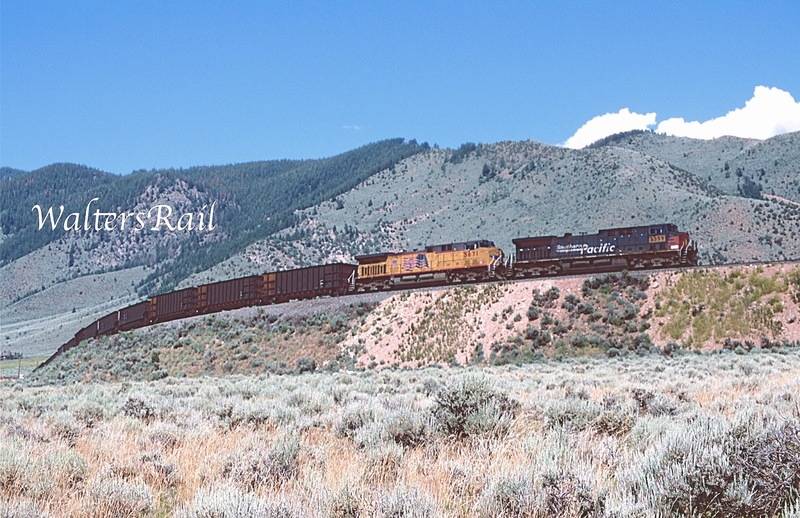 In its prime, the Craig Branch was arguably the most spectacular railroad in the world. I know that is saying a lot, but from the Crater Loops through the horseshoe at Rock Creek, past the red lava at Volcano to the narrow confines of Egeria Canyon, this line traversed territory that almost anyone would have told you was impassible by railroad. I am not the only one to have stood at the Crater Loops and peered north over a mile away to a loaded coal train, in the distance looking as small and defenseless as a butterfly larva, slithering down the side of an extinct volcano, and wondered who in the world had the audacity (insanity?) to construct such a route. 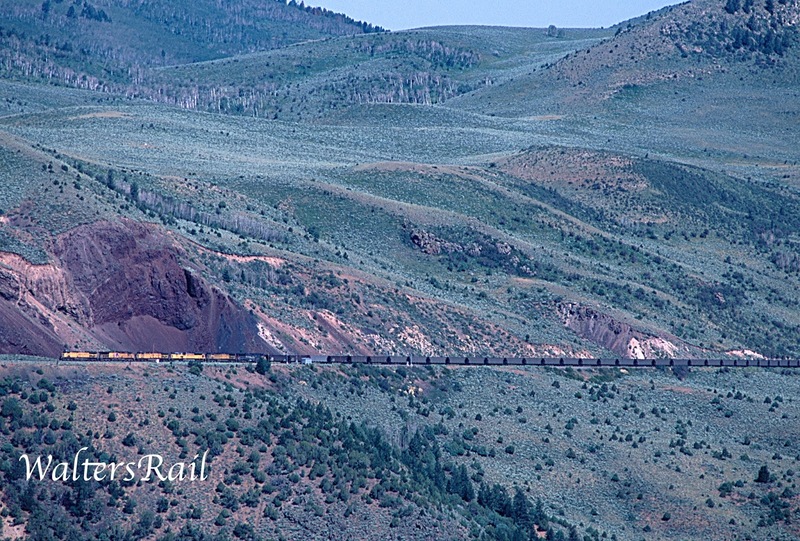 For years, the Rio Grande ran coal train upon coal train through this spectacular territory. Then it was Southern Pacific’s turn (after the Rio Grande purchased the SP, a mouse swallowing a rat). Finally, the Union Pacific came to town. 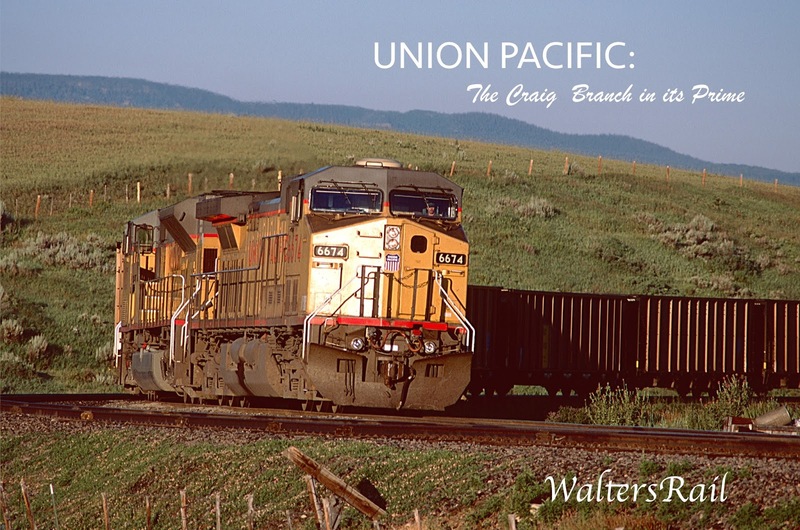 This post will concentrate on Union Pacific’s operations in the early 21st century – when the Craig Branch was crawling with trains. The Craig Branch Running North and West From Bond. Unfortunately, as I write these words (December 2017), the Craig Branch has become almost as extinct as the volcano that names one of its passing sidings. 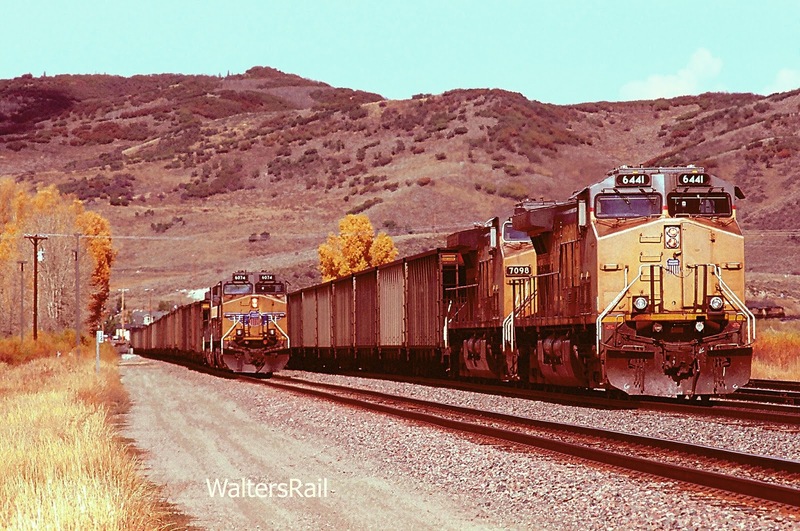 According to friends in Colorado, the line now sees one coal train and one local freight each way per week, and these pitifully few movements often run in the dark. In addition, the one power plant still being served off the Craig Branch is scheduled to be, and may already have been, converted to natural gas. When that happens, there will be no coal trains at all on the Craig Branch. To me, this is as sad and discouraging as the graffiti that has metastasized on railroad boxcars. The current Administration has promised to revitalize the coal industry, so it is just barely possible that traffic on the Craig Branch will resurrect – barely possible. My fingers are crossed. If such should occur, I will be back to Colorado in a heartbeat. Until then, this post must suffice. 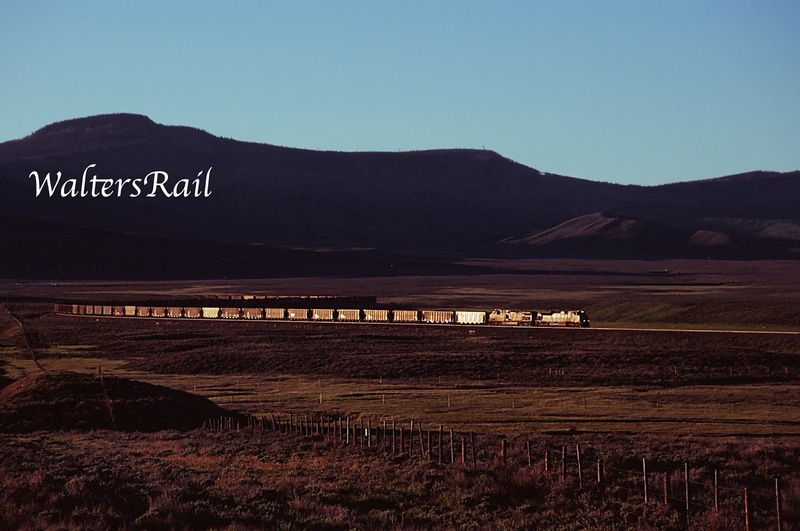 So much has been written of David Moffat’s dream to build a railroad west out of Denver across the Rocky Mountains, of the temporary line constructed across the top of the Continental Divide at Rollins Pass, of the eventual construction of the tunnel under the Divide, and of the connection built in the 1930’s, linking Moffat’s line at Bond with the original Rio Grande mainline at Dotsero, that few people remember anymore that, because of the Rio Grande’s original refusal to allow a connection, Moffat’s railroad was forced to leave the valley of the Colorado River at Bond and climb north into the high plateau of northwestern Colorado toward the coal fields of Routt County. 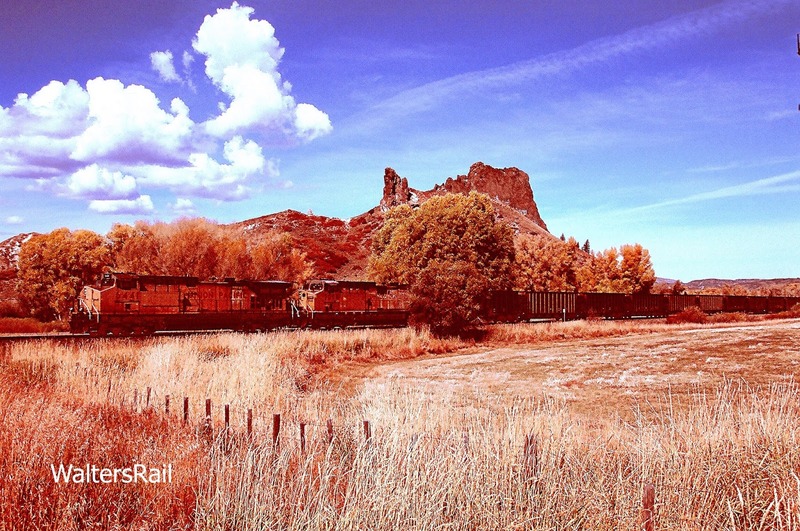 While the construction hurdles of building a railroad through the teeth of the Rocky Mountains have been rightly celebrated for many years, the line north from Bond has often been overlooked. Yet here the engineers encountered terrain entirely different from what had gone before yet every bit as challenging and treacherous. 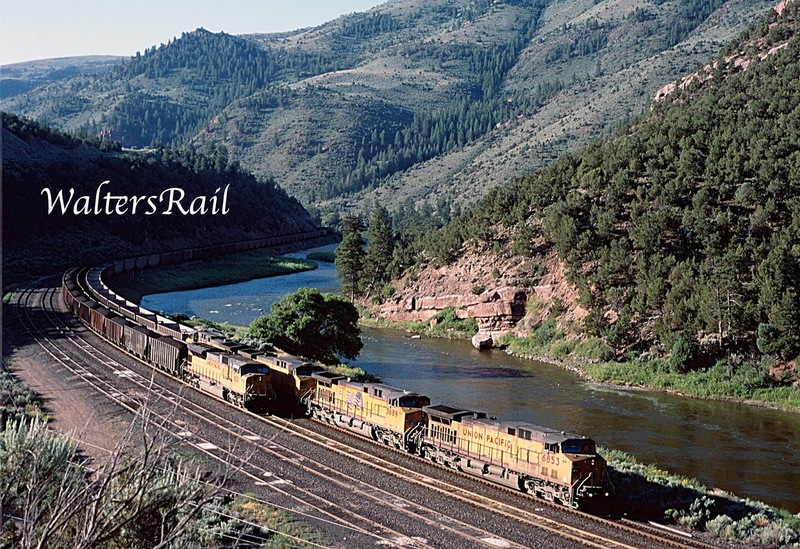 First, the railroad was required to climb north out of the valley of the Colorado River. Bond sits in what in some parts of the world would be called a canyon, though in Colorado it is just another spot along the river. The line leaves the valley on a steep slope, climbing steadily northward, crossing state highway 131 at grade, then continuing to climb a forested ridge, cars rumbling past the few clapboard houses and post office that comprise the settlement of Bond. After about three miles, the tracks turn east, then horseshoe back to the west at what today is called Copper Spur Road, then turn north again through more trees. Because of the tight confines of the curve and the heavy foliage, I have never taken a decent image at the Copper Spur horseshoe, nor have I ever seen one. North of the horseshoe stands a ridge that is clear at the top. I suspect that early of a summer’s morning, when the sun rises north of due east, one might obtain a good shot from that ridge. If the Union Pacific ever starts running trains again on the Craig Branch, I will have a look. 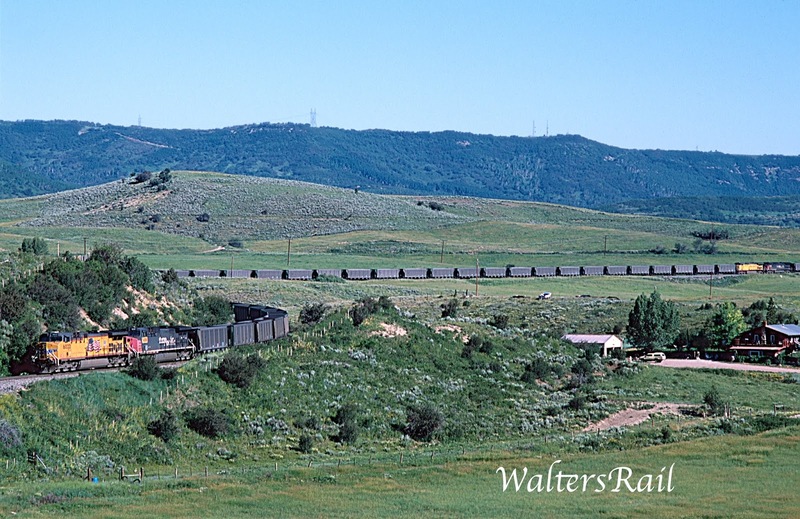 As the railroad climbs, state highway 131 curves westward, following first the valley of the Colorado River, then turning north in the valley of Rock Creek to another tiny village – McCoy, population 24 in the 2010 census. A public school once held classes in this scenic but isolated location. The building still stands, though the school was closed long ago. The last time I drove through, a local comedian had placed a hand-written sign on one window: “McCoy Civic Center.” I stopped my Jeep and peered in the window and saw several empty boxes, an old, roll-top desk, books scattered across a very dusty floor and what appeared to my weak eyes to be a silver beer keg! Someone, apparently, had enjoyed himself. North of McCoy runs Eagle County Route 4, a gravel and dirt road that winds up the side of the same ridge climbed by the railroad. About a mile north of town, the road crosses the county line and becomes Routt County Route 4. 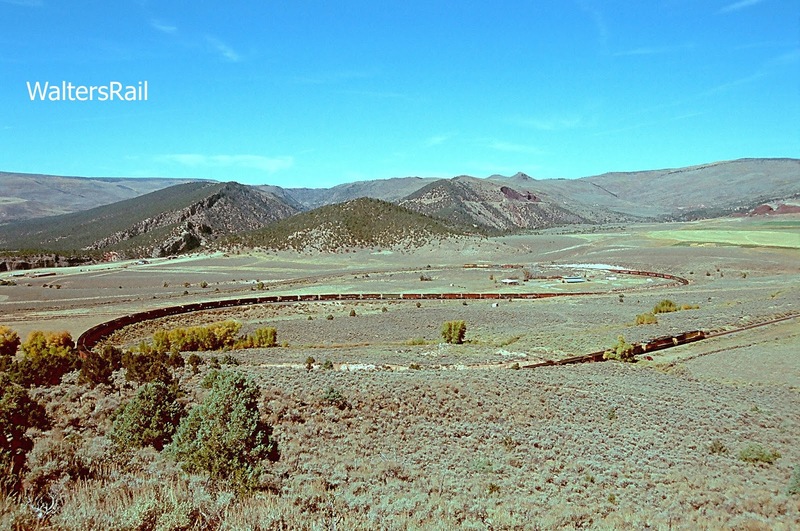 After several additional miles of twisting and turning, your vehicle will emerge, miraculously, beside the railroad tracks as they enter the Conger Mesa, a wide plateau surrounded by mountains, tilting steeply from south to north, named for John Conger, one of a party of three who in 1890 settled the area. The other two men were John Baker and Xavier Benoit. Conger and Baker made the necessary homestead improvements and received the patents for their claims, but there is no record of the Benoit claim. 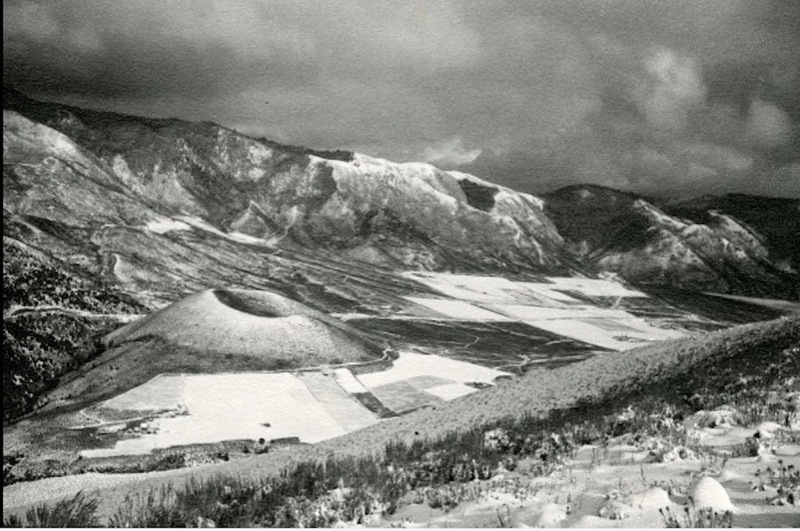 Conger and Baker had no irrigation system, which in Colorado's semi-arid climate is a must. This was likely why these early settlers left their homesteads. 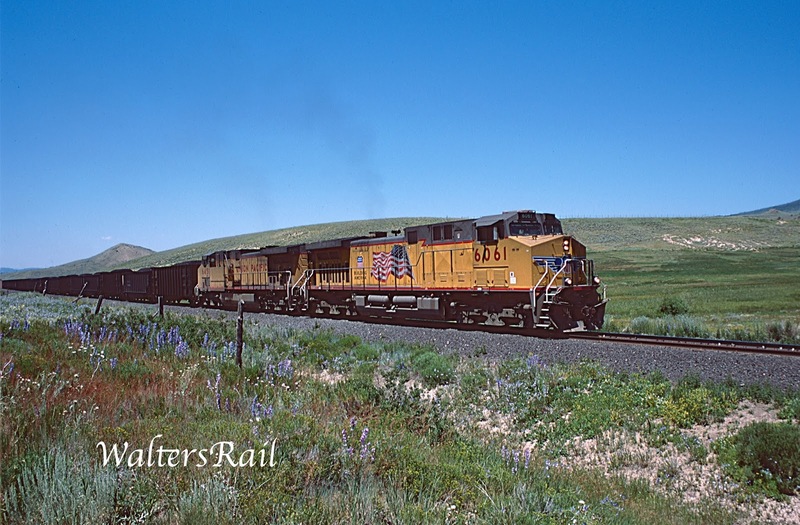 Continuing on the gravel road will bring you in a couple miles to the Crater Loops, one of the most fascinating railroad locations in North America. As the image shows, the tracks run north, then make a horseshoe curve to the south, then make another horseshoe back to the north – all in a relatively short distance. From the top of the north loop to the bottom of the south loop is about 2000 feet, less than half a mile. The west to east width of the loops is also about 2000 feet. The locating engineers for the Moffat Road chose this unique arrangement because in the middle of the loops, the terrain to the north abruptly rises about 100 feet. No railroad could climb that steep of a slope in such a short distance. 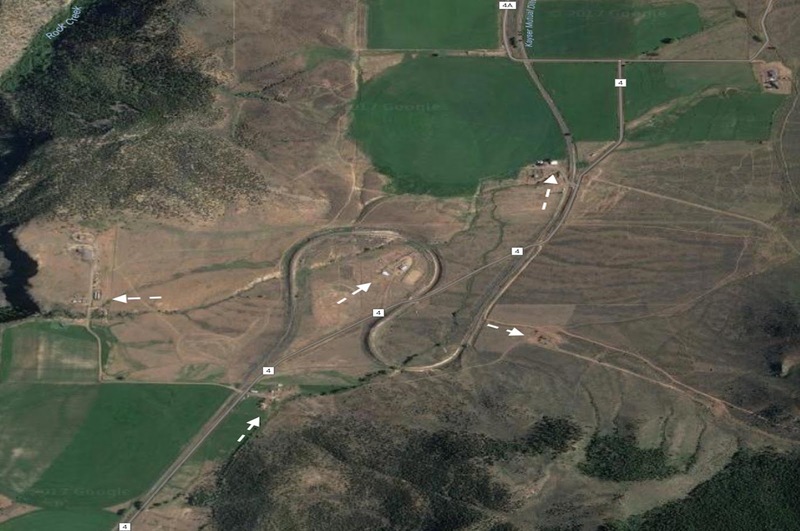 If you look at the five arrows in the aerial view of the Crater Loops, you will see a ranch house and out-buildings in the north loop. West of the loops sits another large ranch house. South of the loops along Routt County Route 4 sits a third house, and a forth is located just east of the loops along a primitive dirt road leading into the mountains. A fifth dwelling sits north of the loops and adjacent to the tracks on the west. In these five houses live the four Horn brothers and their mother Rose. Two brothers work a 2,200 acre cattle ranch that surrounds the loops. The third brother works as an auto mechanic, while the fourth is a homebuilder. I met two of the brothers while I was photographing the loops one morning in 2013. I was sitting on a ridge above the south loop, when two middle-aged men road up on horseback and struck up a conversation. Their faces were long and weather-beaten, like a matching pair of worn cowboy boots. When I told them I was from Oklahoma, they wanted to know about tornadoes and hail storms. “Nobody likes those,” one brother said. “Roofers do,” I said, and they both laughed. They told me that their parents had purchased the property in 1964 – before two of the brothers were born. The fields around the tracks are irrigated with water flowing down the Kayser-Mutual Ditch (see the very top of the first aerial photograph and also the map of the Craig Branch) from Rock Creek high to the north. The creek is separated from Conger Mesa by a steep cliff that drops hundreds of feet. 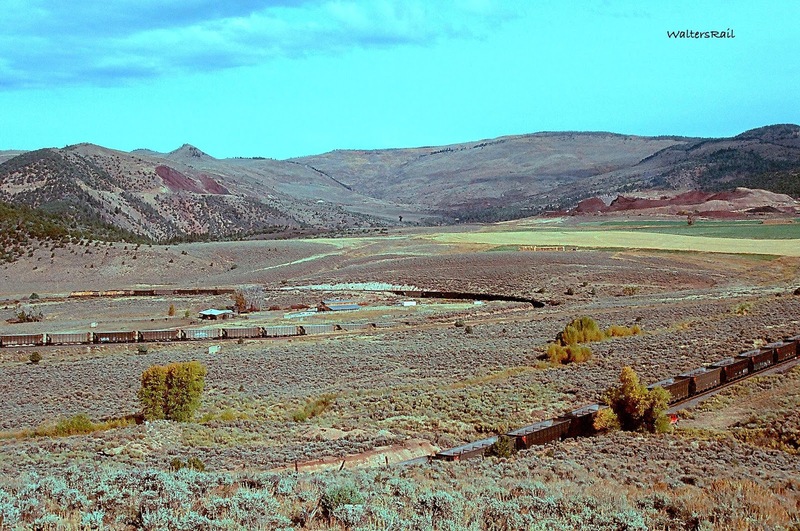 The early pioneers, who created the Kayser Mutual Ditch Company in 1905 (the Kayser family owned a ranch on the plateau), had to become self-taught engineers to divert water from high up in the basin, sometimes using wooden flumes to carry it across gullies and channel it onto their hay fields. Because their fields were thus irrigated, the Kayser family stayed on. The brothers told me I could have free range over their ranch to take photographs, provided I did not bother the cattle. This was a wonderful opportunity, with only two problems: (1) by 2013, there was little traffic on the Craig Branch; (2) the weather did not cooperate. I was at the loops three different days and dodged clouds the whole time. Still I was able to obtain a few worthwhile images. The loops take their name from a geological formation at the north end of the plateau. The area has been a commercial lava rock mine for almost one hundred years; today there are virtually no remnants of the ancient formation. I drove through the area many times without realizing what I was looking at. However, I recently found a photograph taken in 1913 from near the top of an extinct volcano, looking down on what was then I believe a pristine cinder cone. A cinder cone is a steep conical hill of loose cinder and/or scoria (both often generically referred to as "lava rock") formed by explosive eruptions or lava fountains from a single, typically cylindrical, vent. As the gas-charged lava is blown violently into the air, it breaks into small fragments that solidify and fall as either cinders or scoria around the vent to form a cone with slopes between 30-40 degrees, and a nearly circular bottom. Most cinder cones have a bowl-shaped crater at the summit. Cinder cones are commonly found on the flanks of shield volcanoes and stratovolcanoes. A shield volcano is built from a fluid lava flow and, from above, looks something like a warrior’s shield lying on the ground. The low profile is caused by fluidity of erupted lava flowing far from the source. A stratovolcano, on the other hand, is created when stickier lava piles up close to the source of eruption, rather than flowing along the ground. Stratovolcanoes look like mountains – for example, San Francisco peak above Flagstaff, Arizona. Stratovolcanoes are much more common than shield volcanoes. Perhaps the two most famous are Krakatoa, best known for its catastrophic eruption in 1883, and Vesuvius, famous for its destruction of the ancient Roman towns Pompeii and Herculaneum. 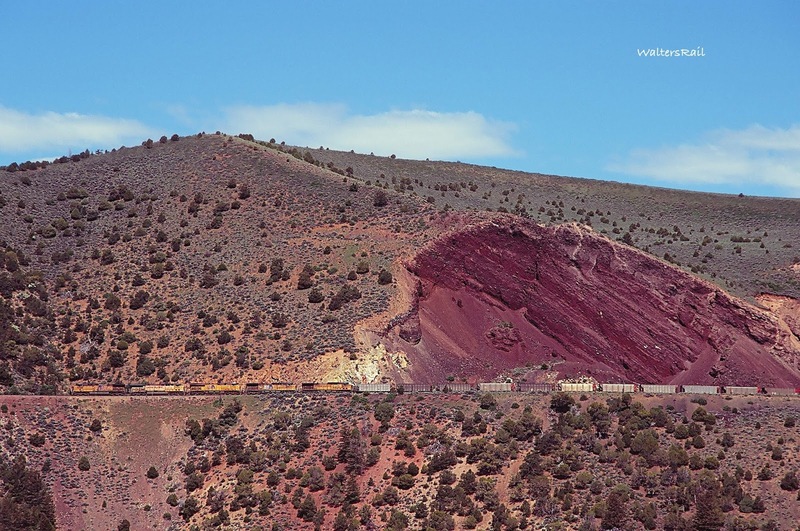 It appears that the cinder cone that the railroad called “Crater,” for which the loops and a nearby passing siding were named, was a vent of a stratovolcano lying about a mile to the northwest. 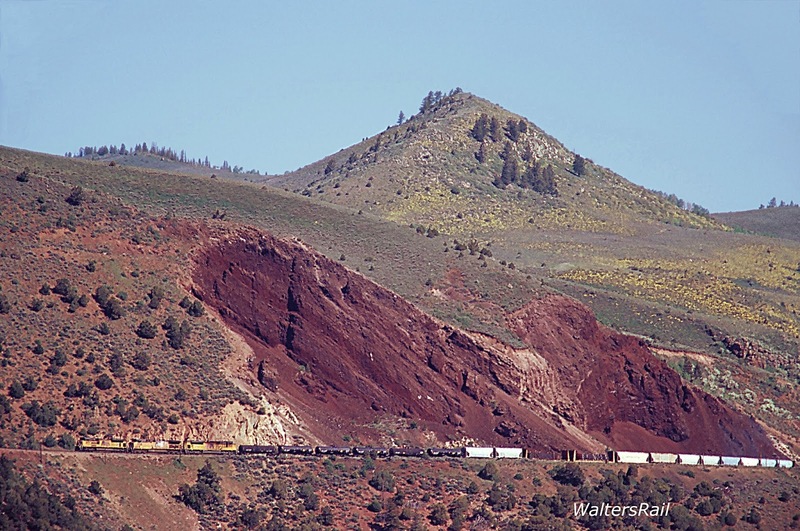 If you look carefully behind the image of the cinder cone, you can see the railroad line coming up from the south, passing behind, then beginning the climb up the ridge. About a half mile left of the image, the tracks turn east into Rock Creek Canyon, an extremely narrow defile in the mountainside. After another half mile, the tracks horseshoe back to the west, still climbing, then twist out of the canyon and begin to climb the side of the stratovolcano. In the image above, the photographer is standing near the top of the stratovolcano. The tracks run about 200 feet below on the hillside. 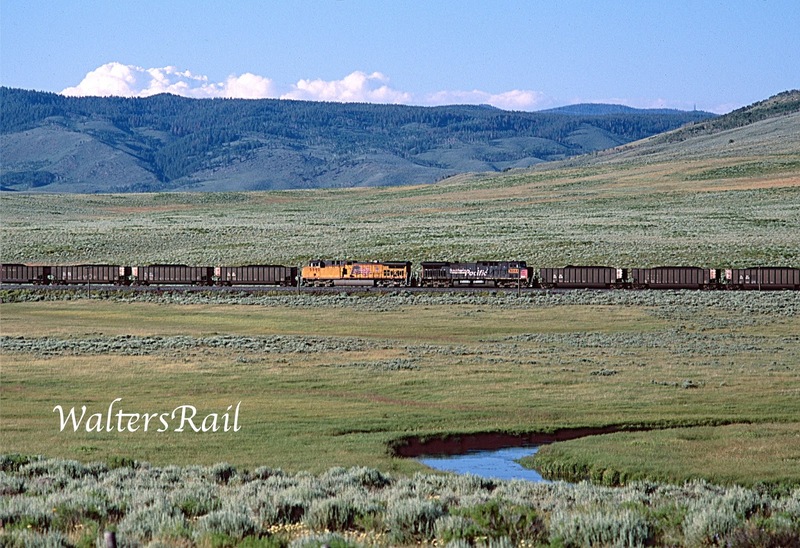 In this image, an empty coal train is climbing through the Crater Loops. 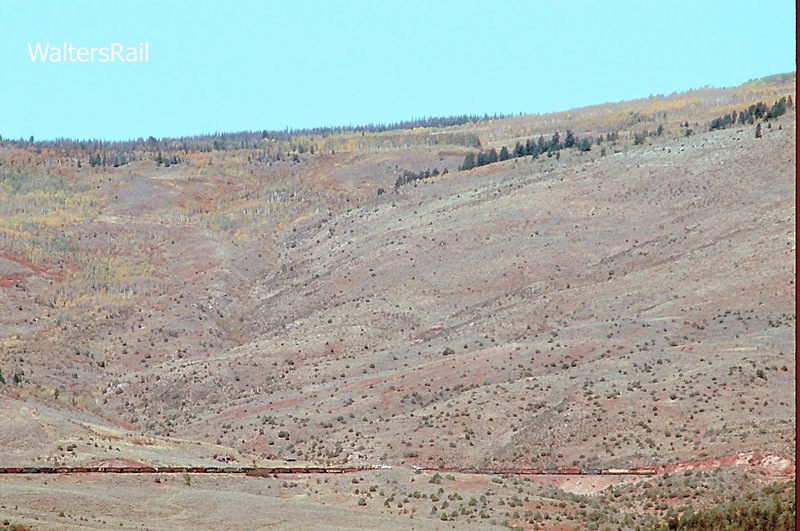 In the right top, just below the ridge, you can see the remnants of the cinder cone as they existed in September 2015. In the upper left, you can see the stratovolcano, with the railroad line carving a narrow plateau about half-way up the slope. You can also see the exposed lava from the large cut made during construction. Below is an aerial image showing the route of the Craig Branch past the cinder cone, horseshoeing through Rock Creek Canyon, then winding up the side of the stratovolcano. Arrow 1 shows the location of the cinder cone, now so thoroughly mined as to be almost flat. Arrow 2 is the bowl of the extinct stratovolcano. Arrow 3 is the location of the photographer in the previous image. Arrow 4 is the horseshoe in Rock Creek Canyon. 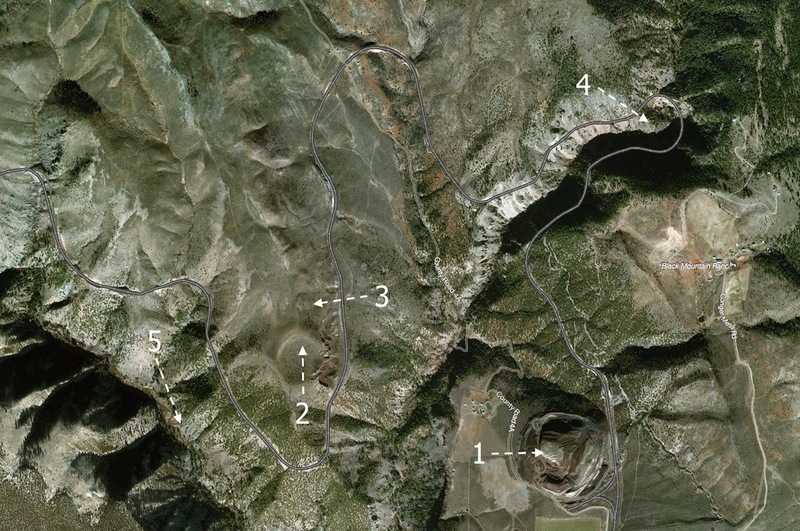 Arrow 5 is the southern entrance to Egeria Canyon. 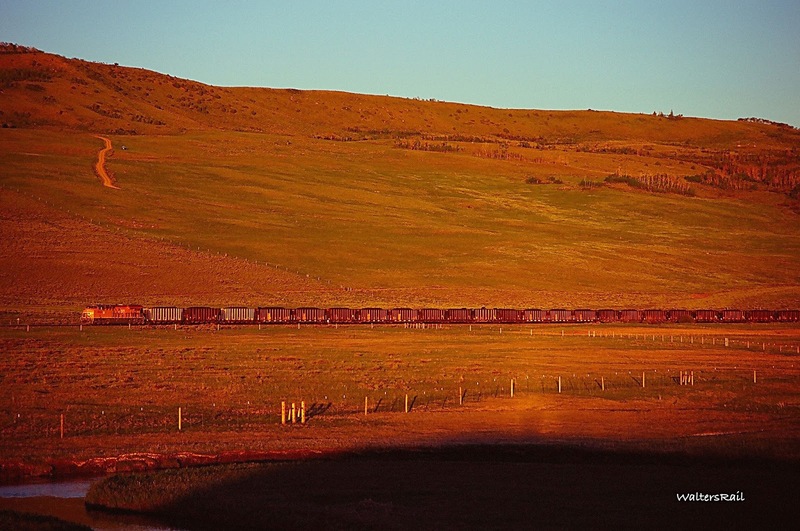 An Empty Coal Train Climbs Through Red Lava at the Appropriately Named "Volcano" Siding. 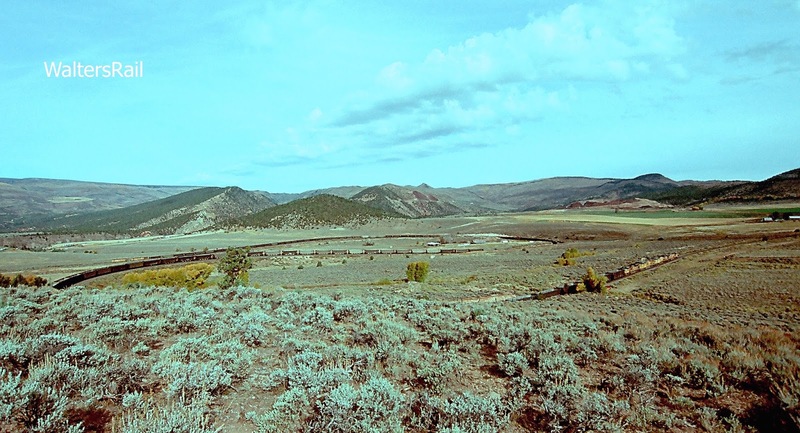 The horseshoe in Rock Creek Canyon and the extinct stratovolcano can both be approached from the north through Routt National Forest. From Colorado State Highway 134, you can navigate a Jeep or comparable vehicle through some very primitive roads to a spot where you must stop and hike about three miles down the side of the volcano. You will know when you have reached the boundary of the national forest, because the ranch owner has built a fence running straight across the slope. Without trespassing, however, one could take several fine shots of trains on the side of the volcano, assuming there were any trains to take photographs of. And Another. The Bowl of the Volcano is Directly Above the Motive Power. 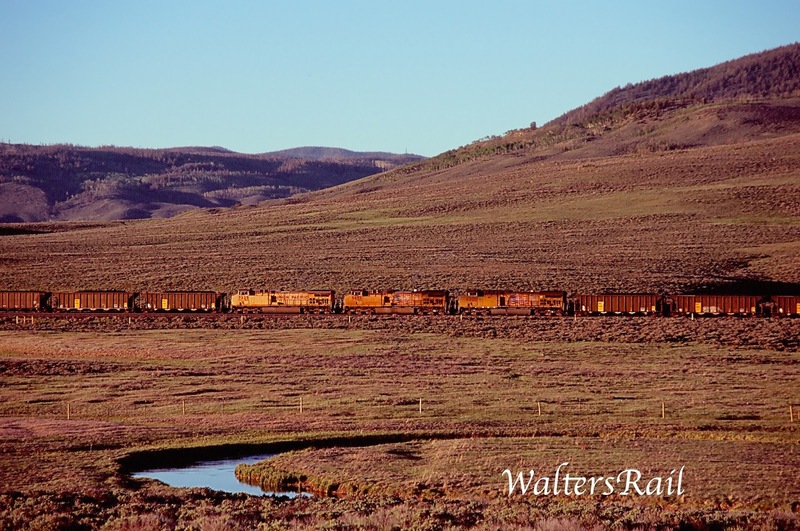 At the Crater Loops, I suffered one of my greatest disappointments as a railfan. 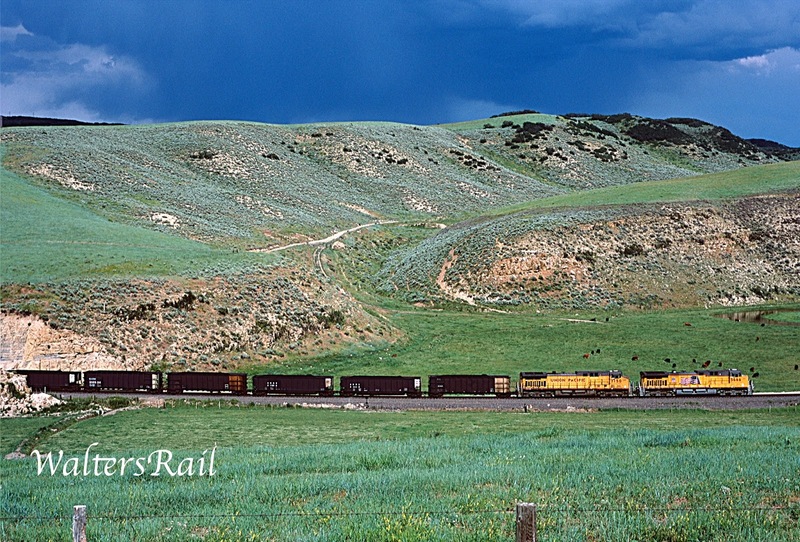 Late one afternoon, the clouds parted as a loaded coal train was coming downgrade through Egeria Canyon. I was positioned on a ridge northwest of the loops – a hike of some considerable effort, during which I dropped my scanner, never to find it. For all I know, it is still sitting somewhere on that ridge. 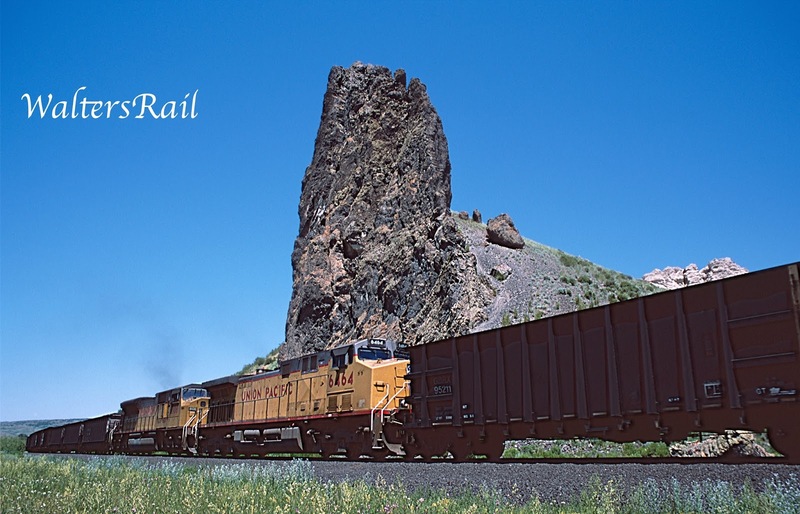 Behind me, I watched the loaded coal train come out of the canyon, curving high on the side of the extinct stratovolcano. In about ten minutes, the train would wind its way through the horseshoe at Rock Creek and then come down on the plateau and into the loops. The light was perfect! Coal Empty Climbing the Loops, Showing Full Breadth of Conger Mesa, with Dormant Stratovolcano in Center. To my horror, however, the train did not glide through the loops. Instead, it pulled into the passing siding at Crater. I could see the train through a stand of mountain cedars, but the foliage prevented a photograph. The sun was sinking rapidly. What in the world was going on? 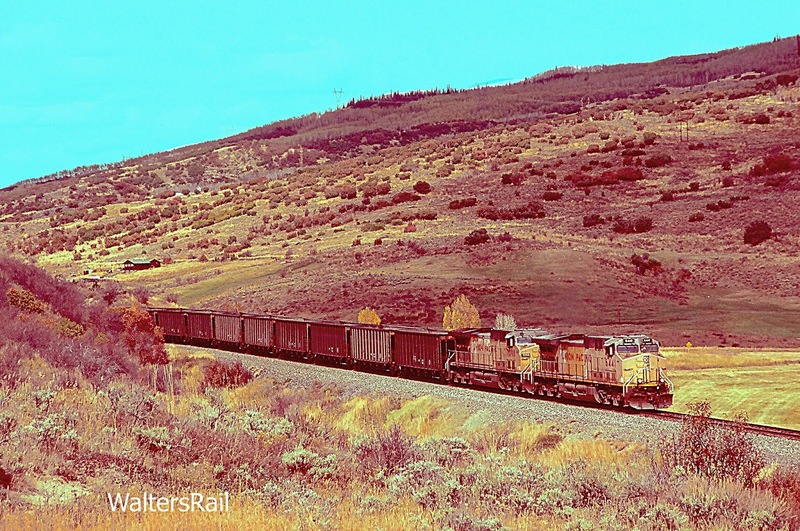 Then to the south, I heard another train climbing the grade toward the loops. A meet! I was going to photograph two trains in the loops! I was actually shaking with excitement, which soon turned, however, to despair. 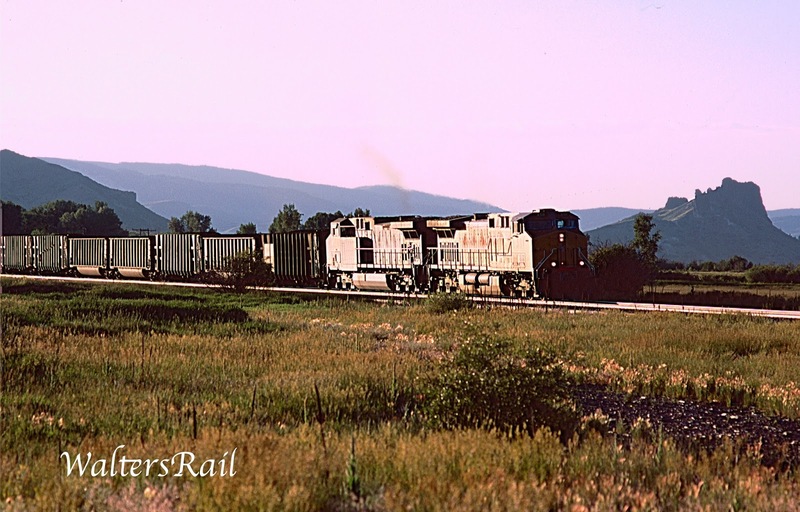 The northbound train was underpowered and, crawling frustratingly up the ridge, appeared at the loops just as the sun dropped behind the mountains to the west. 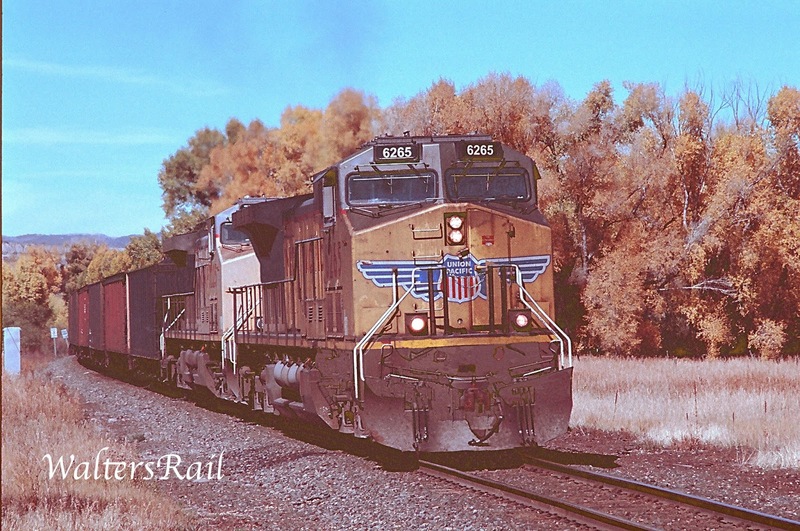 Instead of two trains, I photographed no trains – and lost a scanner in the process. At the termination of Routt County Route 4 sits the Black Mountain Colorado Dude Ranch, high on a cliff overlooking Rock Creek Canyon. 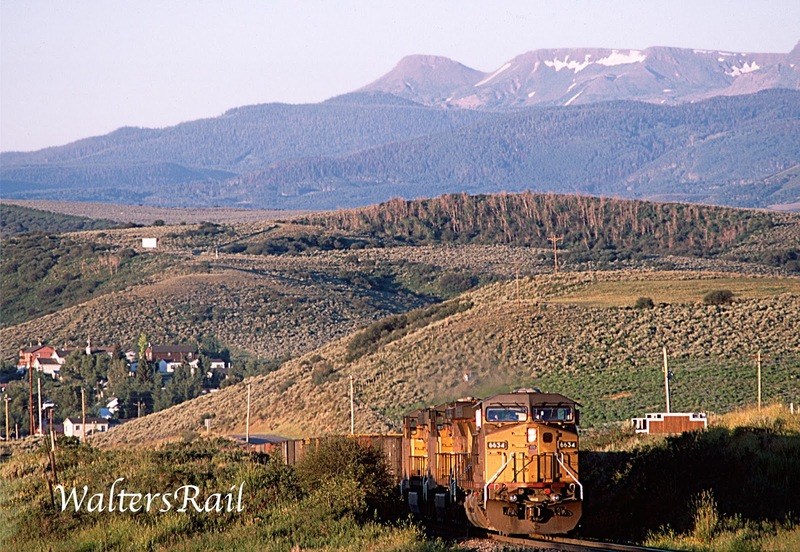 Unfortunately, the timber on the ridge blocks the view of the tracks and horseshoe below, though one can stand on the veranda of the ranch house and hear coal trains grinding upgrade or whining downgrade in dynamics. The people at the ranch are very friendly, though not particularly interested in the railroad. In years past, while photographing the loops, I have seen ten or so “city folk” riding horseback down Route 4, attempting to herd a few cows toward McCoy. Because of its steep sides, Rock Creek Canyon can be approached from above only by one with extensive expertise and mountaineering equipment. Since I lack both, I have only approached from trackside and have never taken a presentable image. I have seen several, however, and tip my cap to those intrepid photographers. The canyon is extremely narrow, and a wide-angle lens is absolutely required for decent photographs. 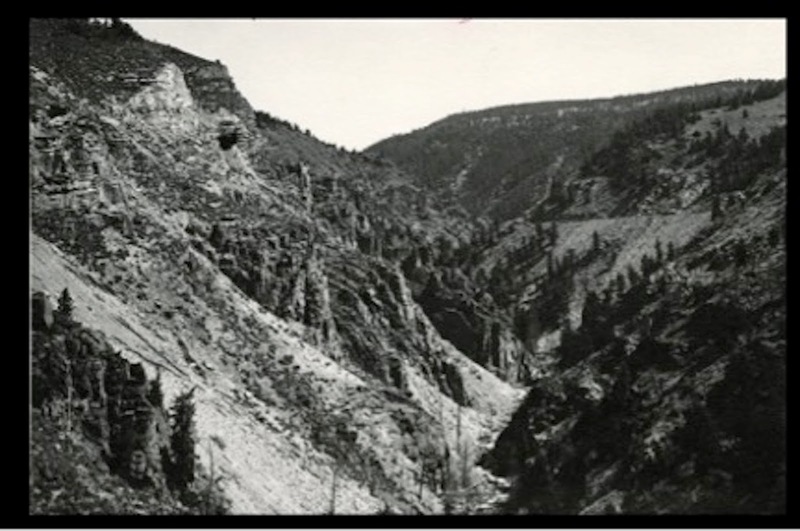 The early 20th century black and white image below, obtained from the Eagle County Library, looks east into the mouth of the narrow canyon. These two and one half miles of track with tunnels No. 45, 46, 47, 48 and the bridge across the creek were considered the costliest piece of grade on the railroad – including all of the construction up the Front Range to the Continental Divide. A high bridge across the canyon in the foreground would have saved about two miles, much money and equally expensive maintenance. A bridge was, in fact, considered, but steel was not easily obtainable at that location. 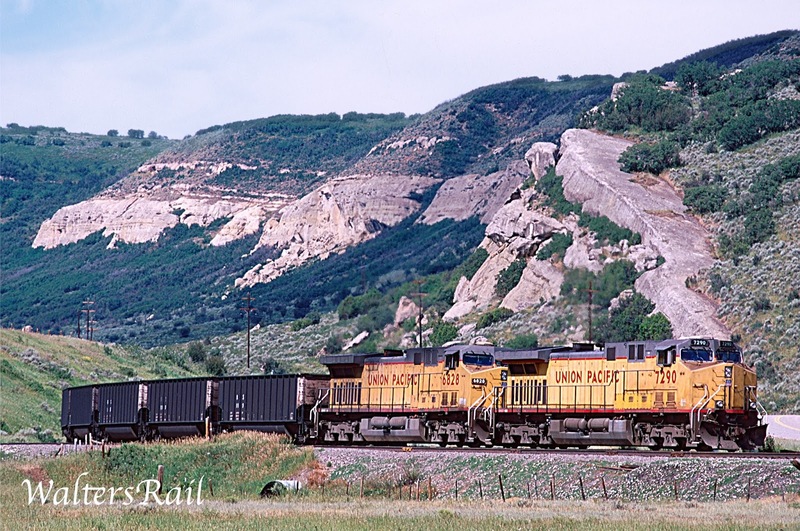 Moreover, David Moffatt wanted the railroad to reach the Routt County coal mines as quickly as possible. So the grade hugs the canyon walls. High up on the left is the west portal of tunnel 48 and over on the right, just above the railroad tracks, is the Conger Mesa ditch. When I look at this image, I am flabbergasted that a railroad was constructed through such terrain – constructed with mules, picks, shovels, dynamite and several thousand men. After making a large, horseshoe curve around the extinct stratovolcano, the tracks enter Egeria Canyon about halfway up the steep slope. Egeria was the author of a detailed account of a pilgrimage to the Holy Land. The long letter, Itinerarium Egeriae (Travels of Egeria) is addressed to her female friends (perhaps nuns or at least fellow Christians) at home in Galicia. Historical details in the manuscript established the date of the journey as the early 380s. I do not know if Egeria Canyon, and the creek at its bottom, were named for this remarkable woman, but a journey through the canyon is almost as taxing as Egeria’s trek to Jerusalem. There is no way to drive into or anywhere near the ravine; it must be approached on foot. I have never done so, though I once talked to a fellow who claimed to have walked the tracks. I was skeptical but said nothing. The east side of the canyon is part of a huge, heavily fenced ranch, the owners of which are zealous in the protection of their property. Above the canyon on the west is a large tract of public land which can be approached only by crossing private property guarded by closed circuit television cameras. 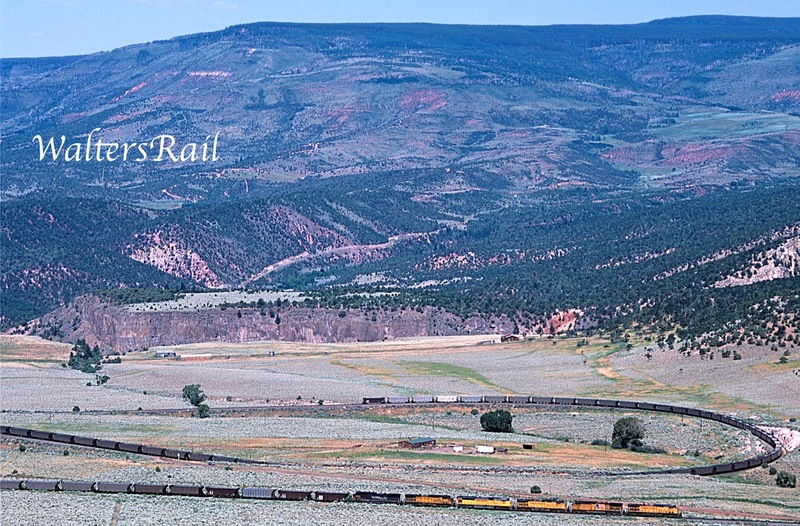 The tracks wind north through absolutely spectacular scenery, then all at once emerge into the Yampa Valley. The effect is like climbing through a briar forest, opening a door and walking into a concert hall. Though the tracks are still climbing a steep grade, the landscape itself is now benign. Egeria Creek is perhaps six feet wide as it curves first left, then right, then left again through lush green grass. Mountains surround the valley like spectators at a sporting event. The torturous landscape of Conger Mesa has been replaced by a scene from the Sound of Music. 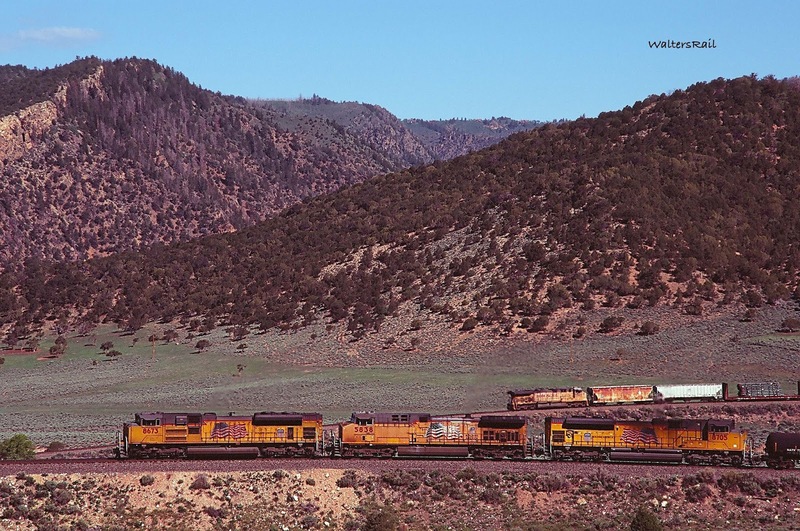 Loaded Coal Approaching Egeria Canyon. The summit is reached at Toponas, an unincorporated settlement with a general store, post office, a few ranch houses, 47 hardy souls as of the 2010 census and a passing siding where empty coal trains once detached their helper units, sometimes “on the fly.” To the south, Egeria Creek flows into Rock Creek, which flows into the Colorado River. 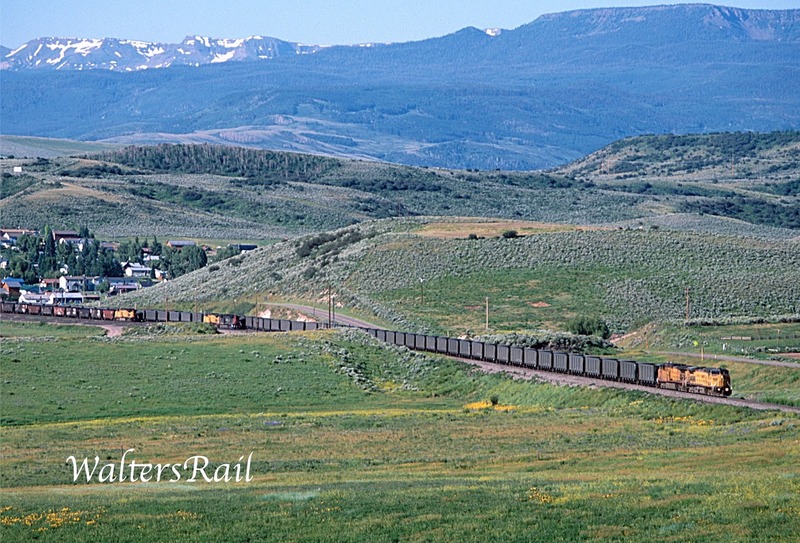 To the north are the headwaters of the Yampa River, the valley of which the railroad follows northwest to Craig. 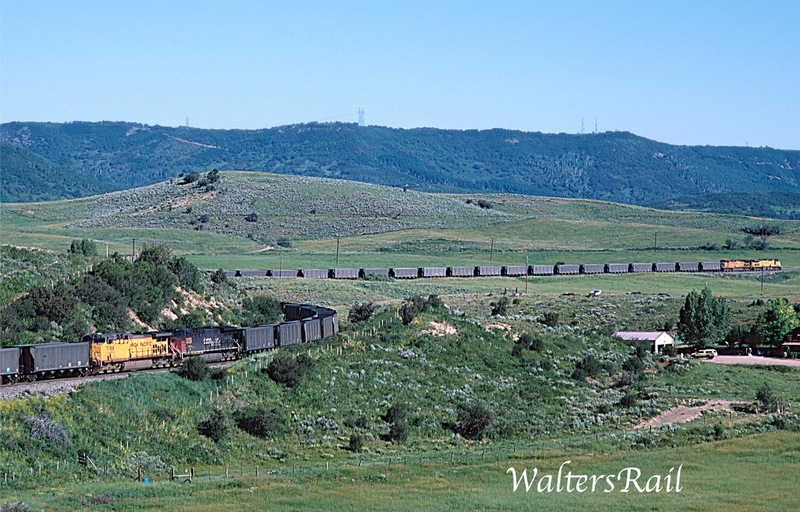 Once past Toponas, empty coal trains roll downgrade to Phippsburg, a division point with a sizable yard. 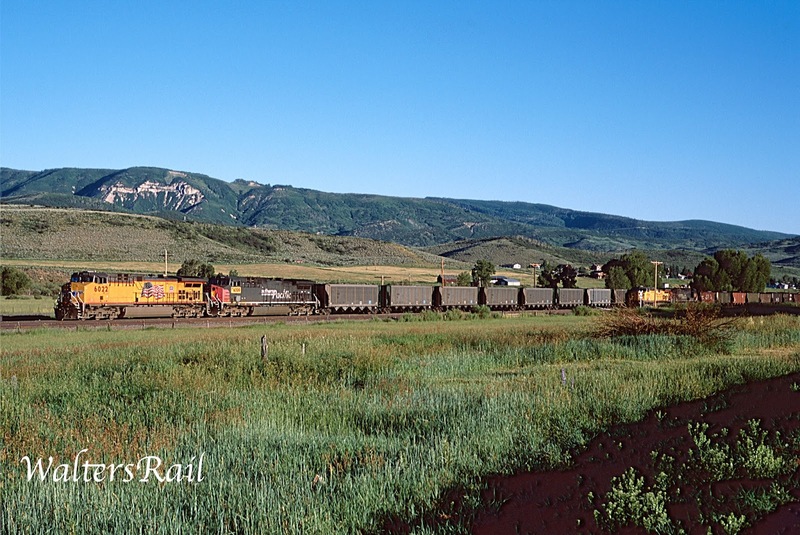 In 2005-06, there were always four or five coal trains, some empty, some loaded, waiting for fresh crews to arrive from the Oak Tree Inn in nearby Yampa, which also supplied crews for the mainline at Bond. Phippsburg sits at the eastern base of the Flat Top Mountains, which are actually not mountains at all but rather a huge elevated plateau, eroded over the centuries into individual peaks, relatively flat, that look a little like Abraham Lincoln’s hat. The Flat Tops contain over 100 small lakes full of fish and some of the most easily accessible areas above timberline in Colorado. Empty Coal Rolls Beneath Flat Tops, While Two More Trains Wait in the Phippsburg Yard for Crews. 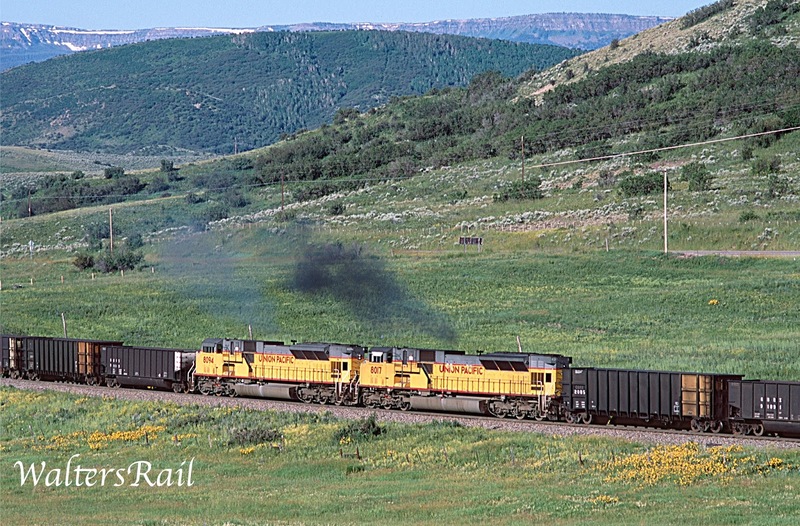 Below: Loaded Coal Train Climbing Upgrade from Phippsburg to Toponas. 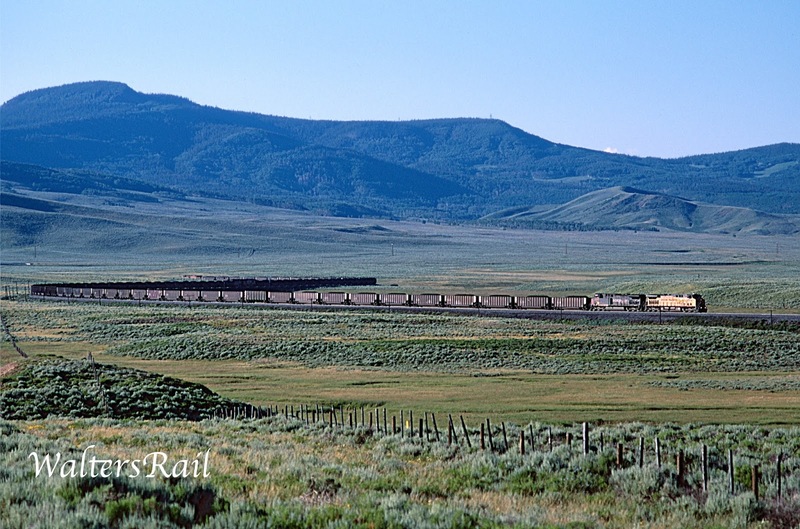 An Empty Coal Train Leaves Phippsburg Beneath the Flat Tops. 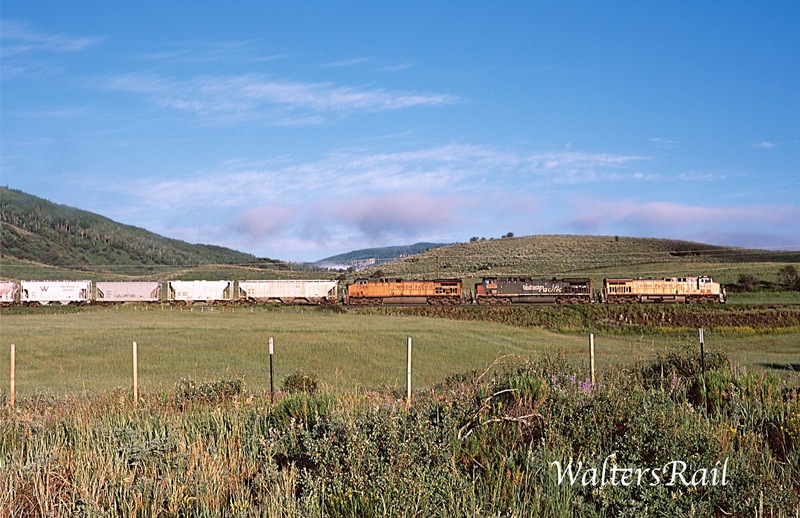 Another Empty Coal Train Beneath Flat Tops, With Phippsburg in Background. Below: An Eastbound Coal Load, pushed by UP 8268 (an SD9043MAC), Is Sitting in the Yard at Phippsburg. 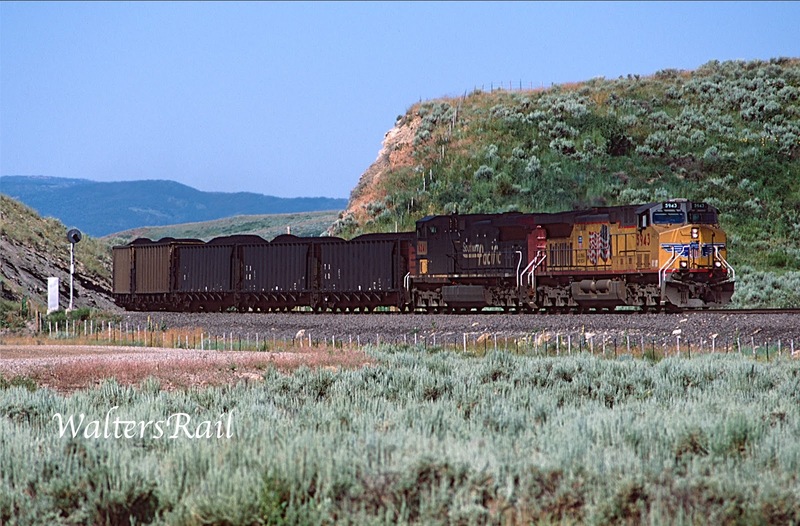 Below: A Loaded Coal Train Leaves the Phippsburg Yard, While Another Waits for a Fresh Crew. A few miles north of Phippsburg, the railroad enters Oak Creek Canyon, a “pocket” landscape by Colorado standards but nonetheless striking. At the top of the west canyon wall sits the now abandoned Edna mine, the outbuildings of which are still visible from the valley below. At one time, Edna was the site of several loading tracks, all of which were removed years ago. 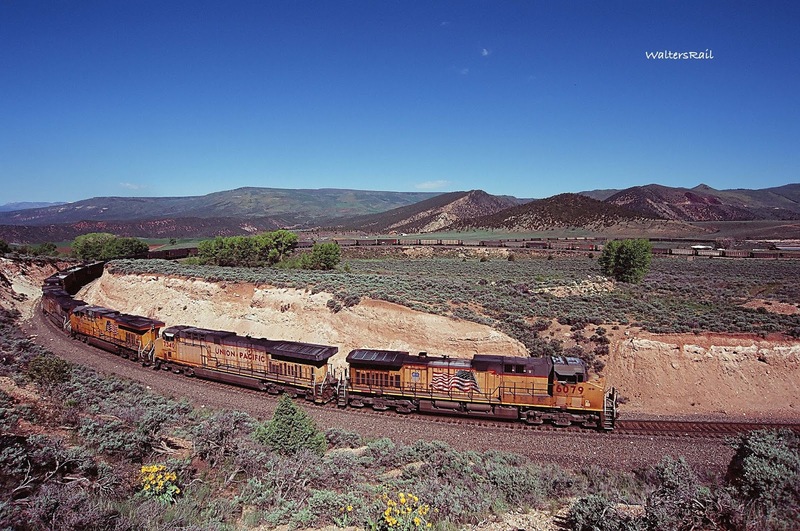 A Loaded Coal Train Passes Beneath Abandoned Edna Mine in Oak Creek Canyon. Coal Empties Approach Oak Creek Canyon. State Highway 131 follows the line closely all the way from Toponas through Oak Creek Canyon to Steamboat Springs. At Edna, Routt County Route 27 climbs the cliffs, providing a good view of the abandoned mine and the significant restoration efforts undertaken recently. Although the forest has not had time to regenerate, open grassland now covers the old mine site, belying what was once an open wound in the belly of the Rocky Mountains. At Steamboat Springs, the swimming pool at the east end of town is supplied by hot springs that bubble up from below ground, generally rising along the fault outlining the western edge of the Park Range, one of the several geologically distinct ranges that together form what we call the Rocky Mountains. Here, geologists have discovered many marine fossils: high-spired snails, big clams called Inoceramun and ammonites that are ancient relatives of the modern chambered nautilus. These all inhabited a huge inland sea that stretched from Canada to Mexico in Cretaceous time. 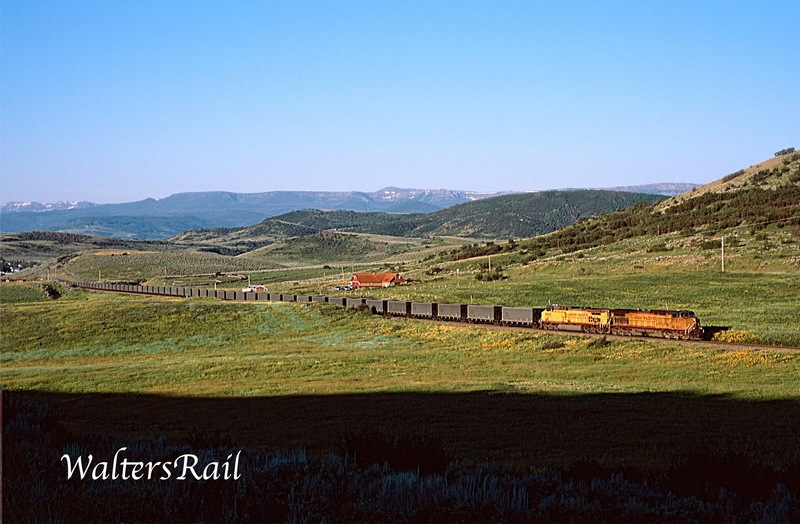 Below--Empty Coal Train Approaching Steamboat Springs. 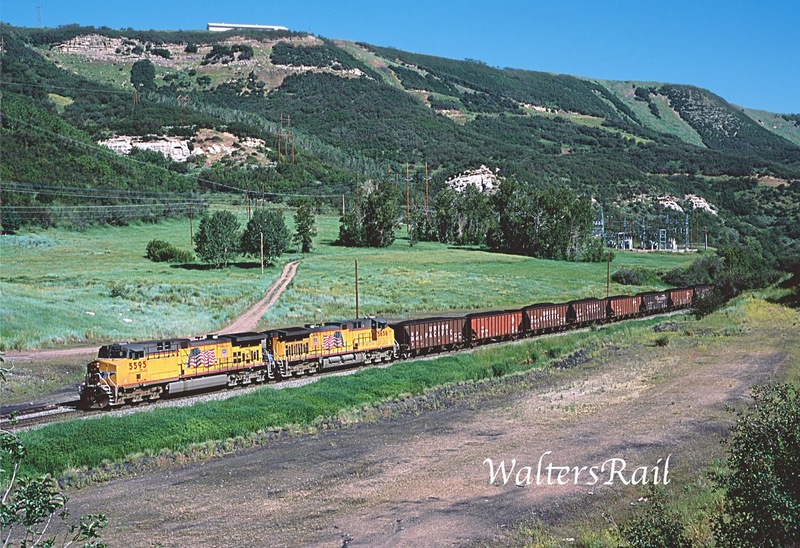 Just south of Steamboat Springs, Colorado State Highway 131 joins U.S. Highway 40, and both highway and railroad make what amounts to a huge horseshoe and head due west toward Adams, where the Energy Spur branches south off the mainline to the Foidel Creek and Energy No. 2 mines, both of which are inactive. Also, Adams is where the lower part of the Mesaverde group forms bluffs north and south of the valley. Widespread throughout the West, the Mesaverde group is composed of sandstone originally deposited as sand along the shore of the Cretaceous sea as it retreated eastward. Thus, the group becomes older as one travels west. The sea receded gradually, with many millions of years passing before it completely departed Colorado. A Loaded Coal Train from the Foidel Creek Mine Approaches the Mainline at Adams. Pushers on Loaded Coal Train Head to Adams. A Coal Load Leaves Eagle No. 5. Once the last power plant served by the Craig Branch converts to natural gas, all of these will be inactive! 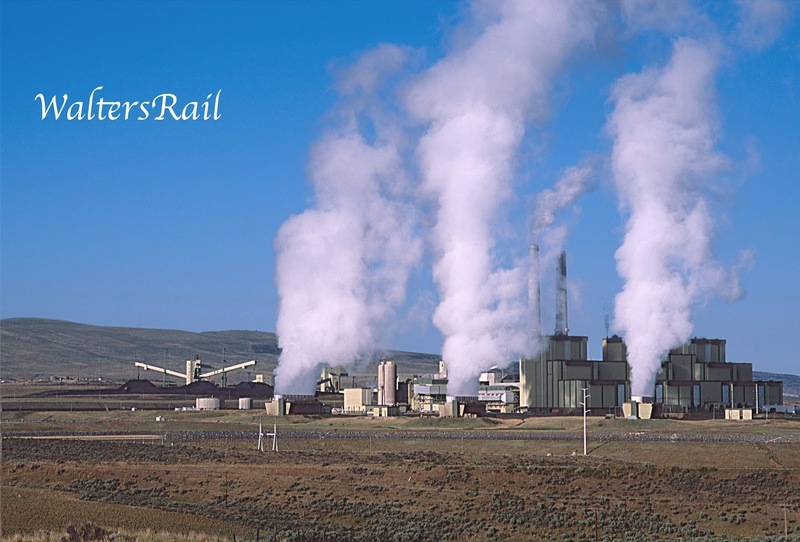 In the early 1970’s, by comparison, three new mines were opened, and the enormous Craig power plant was brought on line. In response, the Rio Grande upgraded the line to CTC. 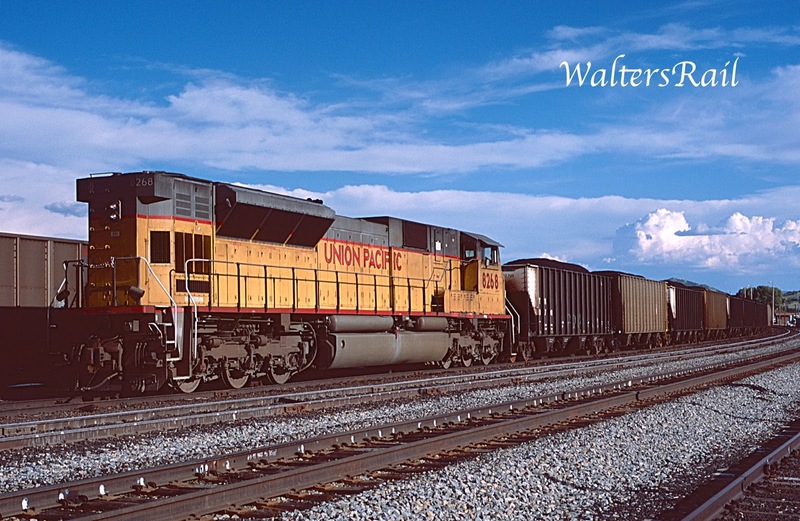 In the 1980’s, the branch saw 14-16 coal trains per week. By 1994, traffic had increased to 25-28 per week, the same traffic frequency as existed in 2005-2006 when most of the images in this post were taken. 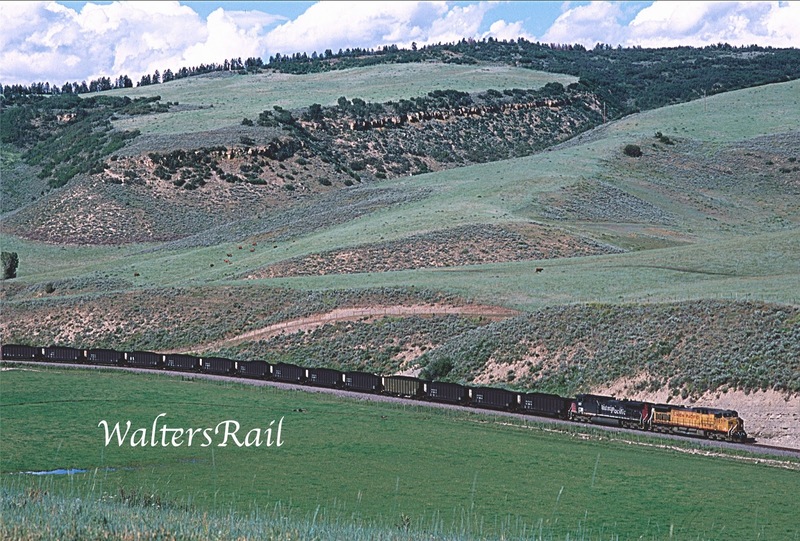 Below: A Loaded Coal Train Crosses the Yampa Valley on its Way to Egeria Canyon and the Crater Loops. Two of the Last Coal Trains in the Yard at Phippsburg -- 2015. Below: Craig Local at Volcano. End of the line is Craig, Colorado, where construction stopped one year after David Moffat's death. The dream of reaching Utah was never fulfilled. Today, the Axial Spur runs south of Craig to several inactive mines, plus the Energy No. 2 mine, which I believe is the only active operation left, if it has not already shut down. Thus, in December 2017, the line is virtually abandoned. I do not know what will become of it. If the last train should run, however, I will hike the tracks all the way from the Crater Loops through Egeria Canyon, which will constitute my fond farewell to this most incredible railroad. The Sun Sets on the Craig Branch. 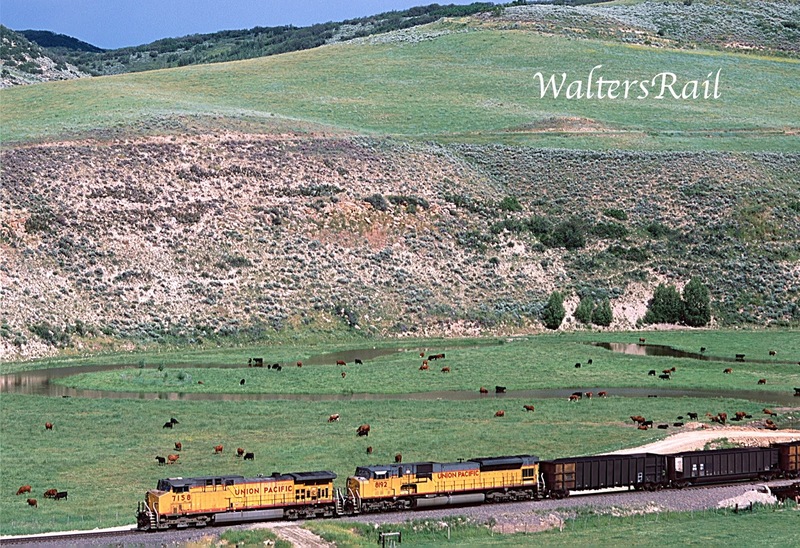 To see the rest of my posts, go to waltersrail.com.